AMES, Iowa — Des Moines philanthropists and Iowa State University alumni Stan and Dotty Thurston are the recipients of the 2017 Christian Petersen Design Award presented by the ISU College of Design. Created in 1980, the Christian Petersen Design Award is given annually to alumni, staff and friends of the university for contributions to the advancement of design through personal aesthetic achievement, exceptional support or extraordinary encouragement and service. The award is named for the noted artist who was Iowa State’s sculptor-in-residence from 1934 to 1955. 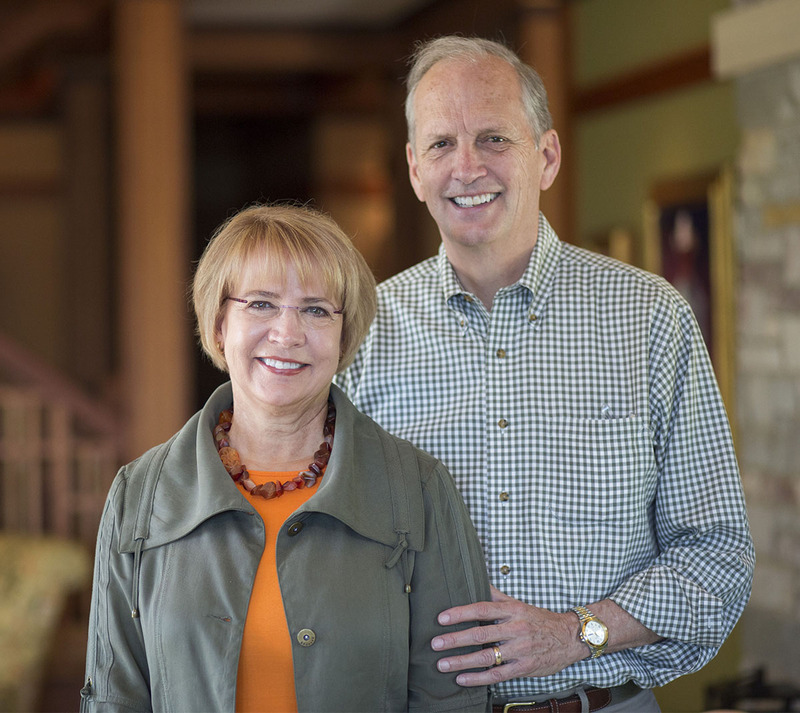 Stan, who received a Bachelor of Architecture from Iowa State in 1969, and Dotty, who received a Bachelor of Science in marketing in 2000, will be honored during Homecoming at the ISU Alumni Association’s 86th Honors and Awards Ceremony. The public event will begin at 1:15 p.m. Friday, Oct. 27, in Benton Auditorium, Scheman Building, Iowa State Center. A dessert reception will follow. “Stan and Dotty have a long history of engagement with Iowa State University and the College of Design. They particularly understand the importance of investment in support of a high-quality education for generations of design students,” said Luis Rico-Gutierrez, dean of the ISU College of Design. The Thurstons highly value the education they received from ISU and seek to provide current students with enriching experiences. They have invested in the College of Design’s Curriculum-Based Design Outreach Fund, LEED Platinum-certified King Pavilion building addition, completed in 2009, and Rome Program. Since 2005, Stan has served on the college’s Advancement Council. In 2014, he established the Stan G. Thurston Professorship in Design Build to support the convergence of high-end digital fabrication technology and its application to design-build projects that benefit local communities. The Thurstons also established an Alpha Sigma Phi Foundation fund to help undergraduate students attend leadership programs. Stan has been active with Alpha Sigma Phi Fraternity and Foundation for nearly 50 years. In 1999 he helped re-establish the Iowa State chapter, leading the effort to renovate a house christened “Thurston Manor” in his honor. The Thurstons are members of the ISU Order of the Knoll, the President’s Circle and the Campanile Society, as well as life members of the ISU Alumni Association. Stan graduated from Marshalltown High School and completed a year at Marshalltown Community College before transferring to Iowa State’s architecture program. Following graduation from ISU in 1969, Stan served in the U.S. Army from 1969-1972, including a year in Vietnam, and was awarded a Bronze Star Medal for meritorious service. He received a Master of Business Administration from Harvard Business School in 1974 and began his career in the residential development business in Toronto before joining Life Care Services in Des Moines in 1977. Life Care Services was at the forefront of developing continuing care for seniors nationwide. Together with the construction management firm the Weitz Company, LCS has developed and manages more than 70 comprehensive senior communities, providing a continuum of services from independent housing to assisted-living and skilled-care facilities. Prior to his retirement in 2006, Stan served as LCS president, CEO and chairman of the board. Among their notable achievements, Stan and colleague Fred Weitz lobbied successfully for federal legislation that helped seniors obtain tax credits for housing. In recognition of his efforts, Stan was the recipient of the first Lifetime Achievement Award from the American Seniors Housing Committee in 2007. Stan joined Alpha Sigma Phi Fraternity as a sophomore in college and has been engaged with the fraternity and foundation ever since. He served on the Iowa State House Corporation from 1978-2013; the National Fraternity Board of Directors from 1988-1996, including as treasurer (1990-1992), vice president (1992-1994) and president (1994-1996); the Foundation Board of Directors from 2000-2010, including as chairman from 2001-2005; and the Board of Advisers from 2013-2015. He received the Delta Beta Xi Award for sustained service in 1977, the Distinguished Service Award for a lifetime of service in 2000 and the Distinguished Merit Award for success in the profession in 2007. Stan has served on the Alzheimer’s Association’s Greater Iowa Leadership Council since 2007 and was a member of its national board of directors from 2014-2016. He is president of LifeQuest Ministries, a nondenominational church he and Dotty co-founded with friends in 2015. He previously was the vice chair of the Nature Conservancy Iowa Board of Trustees from 2007-2014. Dotty graduated from Cedar Rapids Washington High School in 1970 and studied interior design at Iowa State. She worked in banking and as a real estate agent, eventually becoming a certified residential appraiser for Hayes Appraisal and Associates, with her own office in Marshalltown. She retired in 1994. Dotty received an associate’s degree from Des Moines Area Community College in 1998 and a Bachelor of Science in marketing from Iowa State in 2000. Since then she has served on the boards of organizations including Greater Des Moines Habitat for Humanity, Blank Park Zoo, DMACC Foundation and LifeQuest Ministries. She has co-chaired the Habitat women’s build in Des Moines and traveled four times to build houses in El Salvador. She received the 2014 Governor’s Volunteer Award for service to the organization, and she and Stan received the 2014 Habitat for Humanity Key Individual Award. Dotty is a past president of Anawim Housing, a nonprofit that helps provide safe, affordable housing in Des Moines neighborhoods, and a co-founder of Women Empowering Families, which supports families with children who call Anawim Housing home. In 2010 she co-founded 100+ Women Who Care, a group of women who come together quarterly to support local charities. The organization has inspired the establishment of dozens of others around the state and nation, including a men’s group called Men on a Mission.